Tiara and her mom Barbara ordered off of the regular menu, and I got a key. I’m a sucker for bar gimmicks. Tiara won at ordering again. I should just get what she gets. 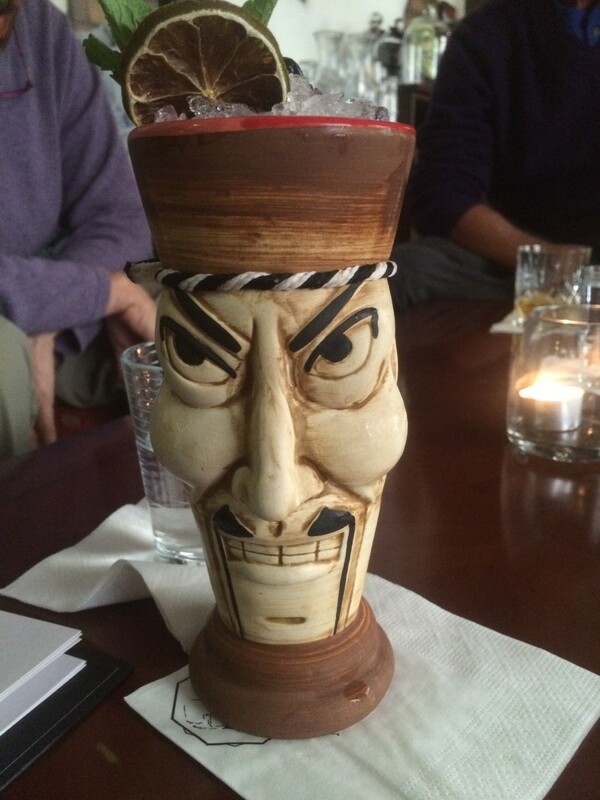 In this case, it was a thai inspired Mai Tai, served in a Guy Fawkes mask Tiki glass (!!!). Anonymous officially won at Tiki mugs. This drink was perfect. Rum, thai brandy, thai spice infused falernum, coconut syrup, orange liquer, and lime. It succeeded as a Mai Tai, but also had this great thai flavor profile that is hard to describe. Definitely some thai basil, kaffir lime leaf, and maybe lemongrass. Add in the most amazing custom tiki mug I have seen, and you’re looking at a world class drink. 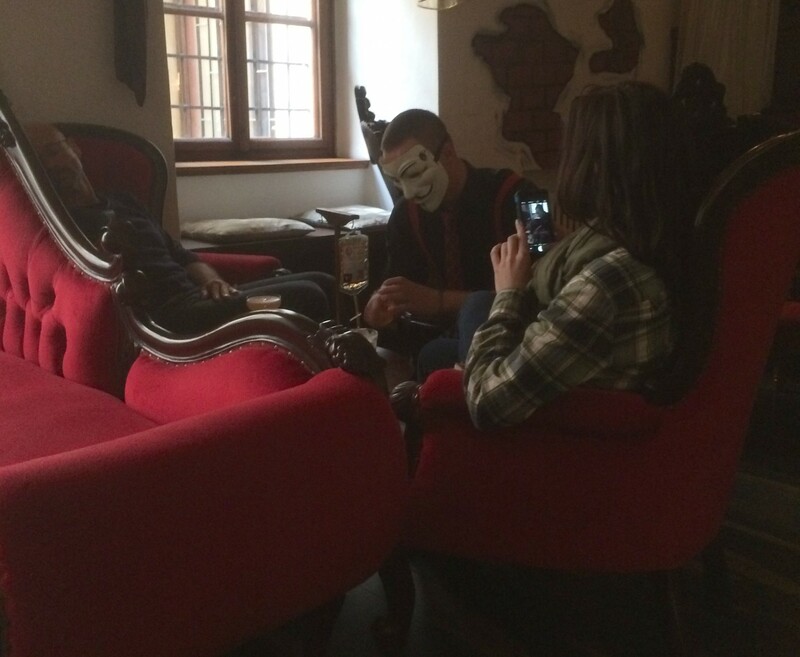 A bartender wearing a Guy Fawkes mask showed up table-side carrying a small kit with a biohazard stamp. Inside were two needles filled with green fluid. Here you can see him dispensing the first. Sadly, the flavors didn’t hold up to the awesome presentation. It was a little bland. 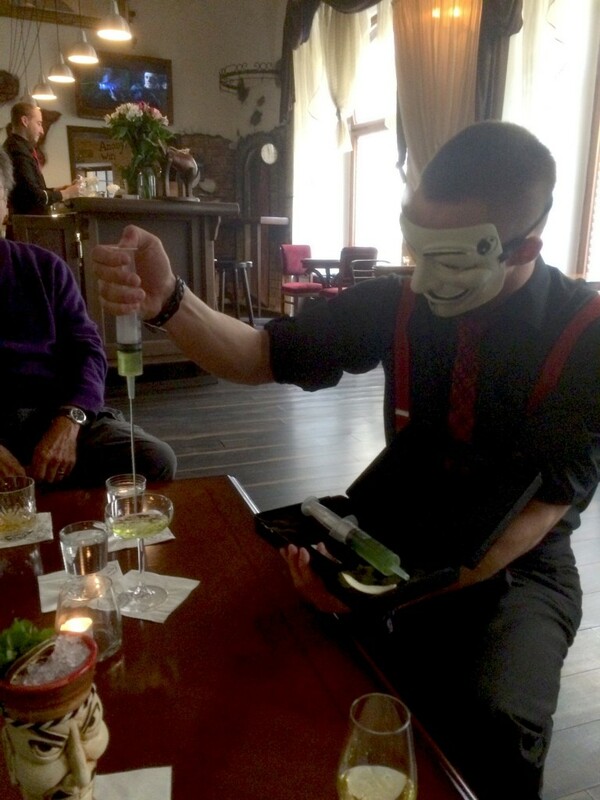 Ingredients were gin, aperitif wine, melon liquer, and a dash of absinthe. I tasted none of those things (save for a hint of melon). Tiara described it as “bubble gum”, I just thought it was sweet and on the bland side. Not sure what they were using for the gin, but clearly something skewing toward vodka. Not unpalatable, but just not standing out in any way. I forgot to take a picture of The Key. It was basically a mix of spice infused rum and aperitif wine served in a small wine glass. It was nicely done, good balance of flavors, if a little sweet. I think it would have made an excellent Falernum on its own. 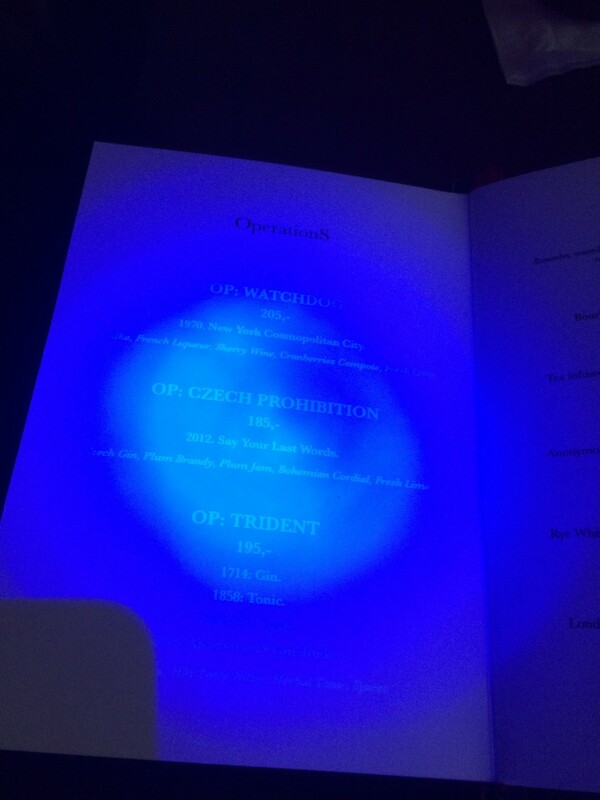 The important part is the little gadget that came with the drink; a small, squeeze activated blacklight flashlight. Remember the mysteriously blank menu pages? Invisible ink baby! So of course, we had to do another round off of the secret menu, now that we could read it. This one was a good riff on the classic highball. 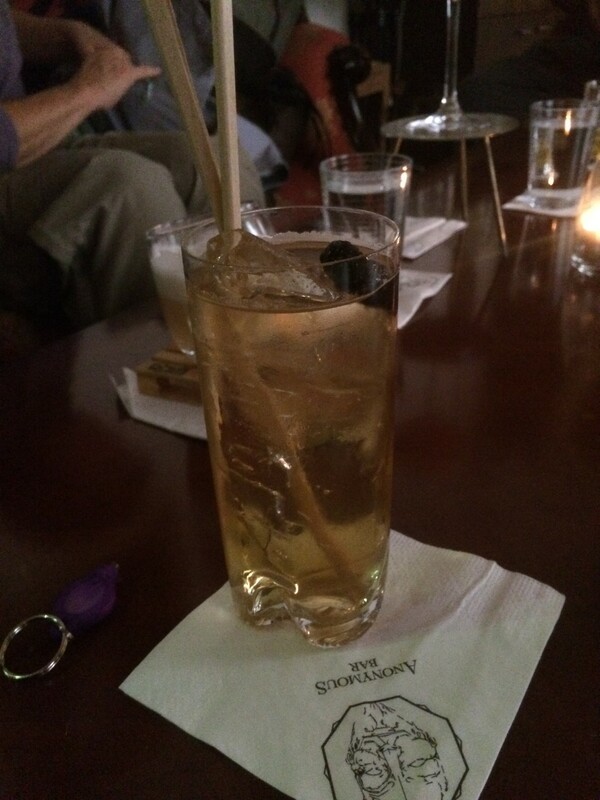 Japanese whisky, soda water, plus plum bitters and a house made plum syrup. I thought they did a really nice job on this one. You got good whisky flavor, with some nice plum notes dancing around it. It was just a tad on the sweet side (it’s hard to add any kind of syrup to a highball), but not so much that I didn’t enjoy the hell out of it. This was Tiara’s drink; Rum, housemade tropical jam, eggwhite, and ango. 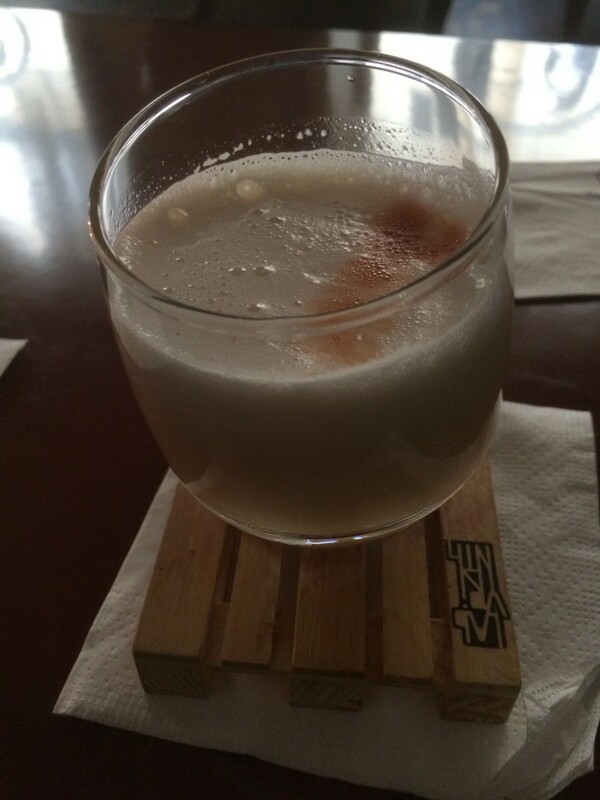 Tiara’s initial comment is that it drank a lot like a Pisco sour. The tropical jam was a little muted in the background, but present if you looked for it. Another competent and tasty tipple. This might have been the best we tried off of the secret menu. That cool elevated stand is actually a modified DVD. Slivovitz has a bad reputation, but man was it good in this drink. 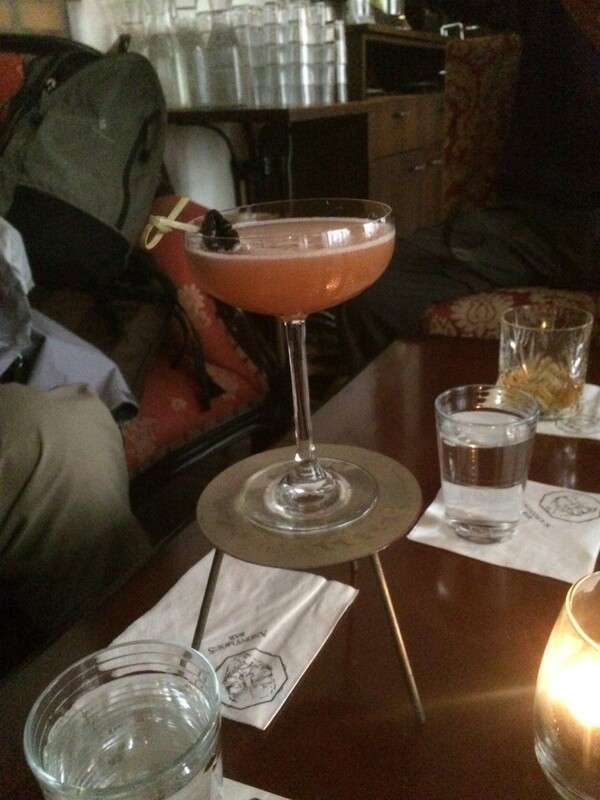 A really nice sour with lime, gin, slivovitz, plum jam, and “bohemian cordial” (becherovka maybe?). Everything was in excellent balance, and gave a really nice expression of a couple aspects of plum. If the drinks had been crappy, I would still recommend going to Anonymous Bar for the service and presentation alone. But the drinks weren’t crappy. Several of them were outstanding. I can wholeheartedly recommend this bar as a great spot to visit in Prague’s Old Town. I’ll leave you with an IV bag presentation I snapped from the table next to us. Hi Guys! Miss you! Living vicariously through your blog… keep up the good drinkin’!